Tetanus is characterized by an acute onset of hypertonia, painful muscular contractions (usually of the muscles of the jaw and neck), and generalized muscle spasms without other apparent medical causes. Despite widespread immunization of infants and children since the 1940s, tetanus still occurs in the United States. Currently, tetanus primarily affects older adults because of their higher rate of being unvaccinated or of being inadequately vaccinated. The image below illustrates tetanus cases in the United States from 1947-2012. As the disease progresses, patients have generalized muscle rigidity with intermittent reflex spasms in response to stimuli (eg, noise, touch). Tonic contractions cause opisthotonos (ie, flexion and adduction of the arms, clenching of the fists, and extension of the lower extremities). During these episodes, patients have an intact sensorium and feel severe pain. The spasms can cause fractures, tendon ruptures, and acute respiratory failure. Patients with localized tetanus present with persistent rigidity in the muscle group close to the injury site. The muscular rigidity is caused by a dysfunction in the interneurons that inhibit the alpha motor neurons of the affected muscles. No further central nervous system (CNS) involvement occurs in this form, and mortality is very low. Although at present, tetanus is rare, it has not been eradicated, and early diagnosis and intervention are lifesaving. Prevention is the ultimate management strategy for tetanus. Clostridium tetani is an obligate, anaerobic, motile, gram-positive bacillus. It is nonencapsulated and forms spores that are resistant to heat, desiccation, and disinfectants. Since the colorless spores are located at one end of the bacillus, they cause the organism to resemble a turkey leg. They are found in soil, house dust, animal intestines, and human feces. Spores can persist in normal tissue for months to years. To germinate, the spores require specific anaerobic conditions,  such as wounds with low oxidation-reduction potential (eg, dead or devitalized tissue, foreign body, active infection). Under these conditions, upon germination, they may release their toxin. Infection by C tetani results in a benign appearance at the portal of entry because of the inability of the organism to evoke an inflammatory reaction unless coinfection with other organisms develops. After the light chain enters the motor neuron, it travels by retrograde axonal transport from the contaminated site to the spinal cord in 2-14 days. When the toxin reaches the spinal cord, it enters central inhibitory neurons. The light chain cleaves the protein synaptobrevin, which is integral to the binding of neurotransmitter containing vesicles to the cell membrane. As a result, gamma-aminobutyric acid (GABA)-containing and glycine-containing vesicles are not released, and there is a loss of inhibitory action on motor and autonomic neurons. With this loss of central inhibition, there is autonomic hyperactivity as well as uncontrolled muscle contractions (spasms) in response to normal stimuli such as noises or lights. Once the toxin becomes fixed to neurons, it cannot be neutralized with antitoxin. Recovery of nerve function from tetanus toxins requires sprouting of new nerve terminals and formation of new synapses. Localized tetanus develops when only the nerves supplying the affected muscle are involved. Generalized tetanus develops when the toxin released at the wound spreads through the lymphatics and blood to multiple nerve terminals. The blood-brain barrier prevents direct entry of toxin to the CNS. Tetanus spores may survive for years in some environments and are resistant to disinfectants and to boiling for 20 minutes. However, vegetative cells are easily inactivated and are susceptible to several antibiotics. Tetanus can be acquired outdoors as well as indoors. The source of infection usually is a wound (approximately 65% of cases), which often is minor (eg, from wood or metal splinters or thorns). Frequently, no initial medical treatment is sought. Chronic skin ulcers are the source in approximately 5% of cases. In the remainder of cases, no obvious source can be identified. Tetanus can also develop as a complication of chronic conditions such as abscesses and gangrene. It may infect tissue damaged by burns, frostbite, middle ear infections, dental or surgical procedures, abortion, childbirth, and intravenous (IV) or subcutaneous drug use. In addition, possible sources not usually associated with tetanus include intranasal and other foreign bodies and corneal abrasions. Underimmunization is an important cause of tetanus. Tetanus affects nonimmunized persons, partially immunized persons, or fully immunized individuals who do not maintain adequate immunity with periodic booster doses. Immunity from tetanus decreases with advancing age. Serologic testing for immunity has revealed a low level among elderly individuals in the United States. Approximately 50% of adults older than 50 years are nonimmune because they never were vaccinated or do not receive appropriate booster doses. The prevalence of immunity to tetanus in the United States exceeds 80% for persons aged 6-39 years but is only 28% for those older than 70 years. 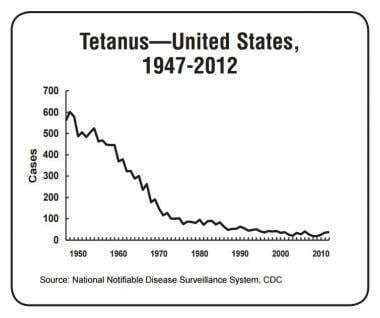 Because of the widespread use of tetanus immunizations, the reported incidence of tetanus in the United States has declined substantially since the mid 1940s. All 50 states require that children be vaccinated before being admitted to public schools. More than 96% of children have received 3 or more diphtheria and tetanus toxoids plus pertussis (DTP) vaccinations by the time they begin school. Heroin users, particularly those who inject themselves subcutaneously, appear to be at high risk for tetanus. Quinine is used to dilute heroin and may support the growth of C tetani. The incidence of tetanus in people who use injection drugs increased 7.4% between 1991 and 1997, from 3.6% of all cases in 1991-1994 to 11% in 1995-1997. Injection drug users accounted for 15% of US tetanus cases from 1998 to 2000 (see the image below). Of the 19 people who used injection drugs and contracted tetanus in 1998-2000, only 1 reported an acute injury. From 1995-2000, 81% of cases in the United States were generalized tetanus, 15% were localized, and 3% were cephalic; 1 case of neonatal tetanus was reported. Although tetanus affects all ages, the highest prevalence is in newborns and young people. In 1992, an estimated 578,000 infant deaths were attributed to neonatal tetanus. In 1998, 215,000 deaths occurred, more than 50% of them in Africa. Tetanus is a target disease of the World Health Organization (WHO) Expanded Program on Immunization. Overall, the annual incidence of tetanus is 0.5-1 million cases. WHO estimated that in 2002, there were 213,000 tetanus deaths, 198,000 of them in children younger than 5 years. Neonatal tetanus is rare, occurring most frequently in countries without comprehensive vaccination programs. The risk for development of tetanus and for the most severe form of the disease is highest in the elderly population. In the United States, 59% of cases and 75% of deaths occur in persons aged 60 years or older. From 1980 through 2000, 70% of reported cases of tetanus in the United States were among persons aged 40 years or older. Of all these patients, 36% are older than 59 years and only 9% are younger than 20 years. Tetanus affects both sexes. No overall gender predilection has been reported, except to the extent that males may have more soil exposure in some cultures. In the United States from 1998 to 2000, the incidence of tetanus was 2.8 times higher in males aged 59 years and younger than in females in the same age range. A difference in the levels of tetanus immunity exists between the sexes. Overall, men are believed to be better protected than women, perhaps because of additional vaccinations administered during military service or professional activities. In developing countries, women have an increased immunity where tetanus toxoid is administered to women of childbearing age to prevent neonatal tetanus. Cephalic tetanus is always severe or very severe. Neonatal tetanus is always very severe. The case-fatality ratio in the United States was 91% in 1947,  21-31% from 1982 to 1990, 11% from 1995 to 1997, and 18% from 1998 to 2000. Current statistics indicate that mortality in mild and moderate tetanus is approximately 6%; for severe tetanus, it may be as high as 60%. Mortality in the United States resulting from generalized tetanus is 30% overall, 52% in patients older than 60 years, and 13% in patients younger than 60 years. Mortality is substantially higher for people older than 60 years (40%) than for those aged 20-59 years (8%). From 1998 to 2000, 75% of the deaths in the United States were in patients older than 60 years. In addition, mortality is notably higher for people who require mechanical ventilation (30%) than for those who do not (4%). Clinical tetanus is less severe among patients who have received a primary series of tetanus toxoid sometime during their life than among patients who are inadequately vaccinated or unvaccinated. Mortality in the United States is 6% for individuals who had previously received 1-2 doses of tetanus toxoid, compared with 15% for individuals who were unvaccinated. Residual neurologic sequelae are uncommon. Mortality usually results from autonomic dysfunction (eg, extremes in blood pressure, dysrhythmias, or cardiac arrest). The importance of childhood immunizations and boosters must be stressed. Midwives and birth attendants in developing and underdeveloped countries should be given training in aseptic birthing procedures. The basics of wound care and first aid should be widely taught. Early recognition of symptoms and signs of localized tetanus and timely access to medical care are essential. For patient education resources, see the Infections Center, Public Health Center, and Children’s Health Center, as well as Tetanus ,Immunization Schedule, Adults ,and Immunization Schedule, Children.